With more than 30 years experience in real estate law, Michael H. Rhodes specializes in acquisitions and development for commercial and multi-family residential property, financing (both private lender and government regulated), divestitures and related tax issues, including representation of clients in various IRS Code Section 1031 tax deferred exchanges, structuring reverse exchanges, tenants in common arrangements and other custom structures, and representation of exchange accommodators. Representation of developers and lessors of build to suit projects for various national retailers. Experience in drafting and amending commercial and residential condominium documents including site condominiums and advising clients on a wide range of condominium and cooperative issues. He is very active in representing clients in the creation and handling of multi-state housing tax credit investor funds for affordable housing projects. He also has over 25 years experience in oil, gas and energy law including contract and agreement negotiation and drafting, transactional matters, primarily involving the negotiation and drafting of purchase and sale agreements, financing, title opinions, title matters, and general legal matters. Mr. Rhodes assisted in the development of a wind energy project in Minden, MI (2005-2006), including the negotiation and preparation of land leases. He has represented major multi-national exploration and development entities and regulated utilities, small independent producers, and plant and pipeline operators. Representation of various healthcare providers on various health care law issues including structuring professional corporations and professional limited liability companies, compliance with “Stark” laws and regulations and other applicable state and federal laws, including HIPAA compliance. 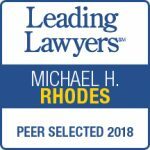 Mr. Rhodes has worked extensively on various private corporate and governmental matters, including state and federal securities law issues. He assisted in the creation of a private water authority, the negotiation and acquisition of a franchise for the private water authority, and assisted in negotiations with a municipal regional water authority. He has advised municipalities with respect to formation and operation of Downtown Development Authorities, and Local Development Financing Authorities involving various real estate issues including the formation, expansion and development of industrial parks. Mr. Rhodes is a frequent speaker at industry seminars for various business, real estate and oil and gas organizations. Active in the mid-Michigan community, Mr. Rhodes is the past President of the Board of Directors for Habitat for Humanity/Lansing; serves on the Boards of the Lansing Symphony, St. Vincent Catholic Charities, and the Mid-Michigan Land Conservancy; and is an active member of the Lansing Rotary Club. Mr. Rhodes earned his law degree at Detroit College of Law (Michigan State University). He joined the Loomis Law Firm in 1982. Eastern Michigan University, B.A., 1972 .